Be Savvy about a New Dangerous Trend: Caffeine Powder the “Cocaine” for Kids? Measles: A 20 Year High in the U.S.
Not Child's Play! Your Niece or Nephew may Be at Risk! Spring marks the end of flu season (and hopefully we won’t have another spring-summer flu like H1N1 last year!). The typical springtime question you may have is, “What is causing my niece or nephew to sneeze so much? 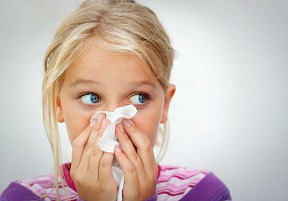 Is it a cold or is it just allergies?” The symptoms can be the same, with their sneezing, coughing and watery eyes. But there are some clues to help a Savvy Auntie figure it all out. Colds are infections caused by many different viruses. They are very contagious - passed from airborne coughing and sneezing, as well as touching something that someone had just coughed on. Allergies, on the other hand, result from your overactive immune system that reacts to relatively harmless substances, such as dust and pollen, as if they were invading bacteria or viruses. It is this immune response that causes symptoms mimicking an infection. This is why symptoms of cold and allergy are so similar. Colds almost always have symptoms of a runny nose and cough. Sometimes they have a congested cough with a yellowish mucus discharge as well as occasional aches and minor fatigue. They often begin with a sore throat and occasionally have a fever. On the other hand, allergy symptoms never have a fever, aches and pains or a sore throat. The most common symptoms are itchy, watery eyes and sometimes a clear, mucus-congested cough. The duration of a cold is anywhere from three days to two weeks, whereas spring allergy symptoms can last for months, until all the pollen from the blooming trees is finished. And the onset of symptoms for a cold usually take a few days to appear in full force, but allergic symptoms occur immediately after exposure to the allergen. So once the trees and flowers start blooming spring allergy symptoms start up. Colds most often occur in winter months, however they can occur at anytime. Allergies, especially seasonal ones, usually appear in spring for flowers and tree pollen and in fall for grasses, but mold and dust allergies can occur any time of the year. Because there are so many different viruses causing the “common cold” there really is no treatment for it or a single vaccine to prevent it. Over-the-counter medications only treat the symptoms and recently these medications have not been recommended for young children because of potential side effects and risk of overdosing them. New over-the-counter allergy medications work well for most people. However, read the labels carefully to see which are better for kids. It’s important to remember to shower and change your nieces and nephews clothes if they are outside for any length of time. Pollen can collect on their clothes and hair, which can continue to trigger their symptoms. So now that you are spring savvy, you can hit the playground in between those April showers!